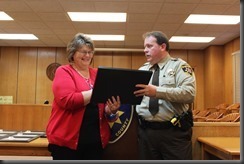 Sheriff David Duke presented Judy Ricks an Appreciation Award for donating several hours of her time to help build numerous Christmas parade floats and a jail facade for the Sheriff’s Office. (Judy Ricks and Sheriff David Duke). 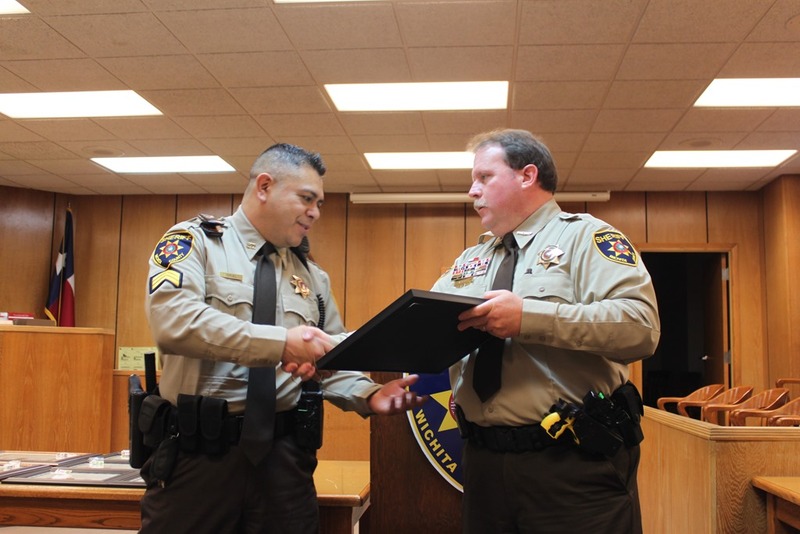 Sheriff David Duke presented a Commendation Award to Sergeant Sergio Teruel who is the supervisor of the four man Fugitive Apprehension Team. Since inception on September 21, 2012, this team has been responsible for 110 arrests, serving 135 felony warrants, 20 municipal warrants, and the filing of 15 new cases. 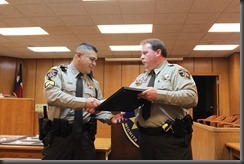 ( Sergeant Sergio Teruel and Sheriff David Duke). 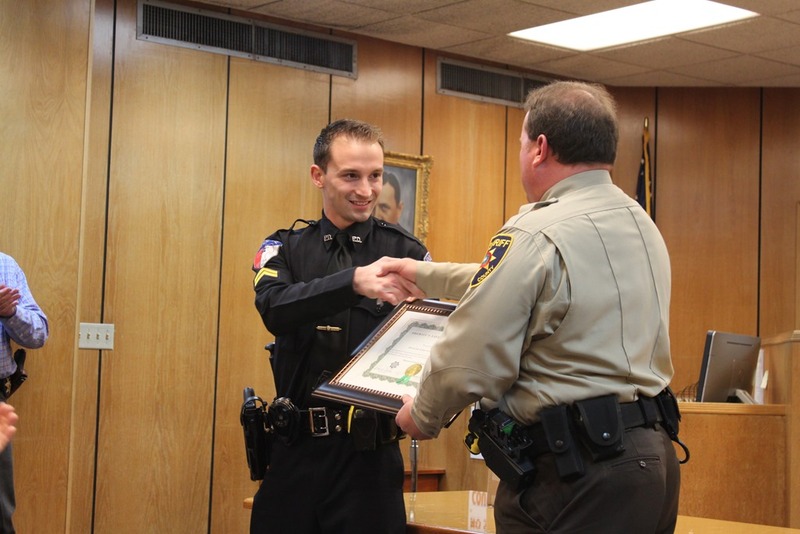 Sheriff David Duke presented Commendation Awards to Chief Deputy Derek Meador, Lieutenants George Robinson and Patrick McFerrin, Deputies Lee Crossman, Victoria Hatcher, and Gabriel Villarreal. The above deputies responded to the eastside of Wichita County where a Sheppard Air Force Base plane had crashed. They were able to remove the pilots to safety until medical personnel arrived. 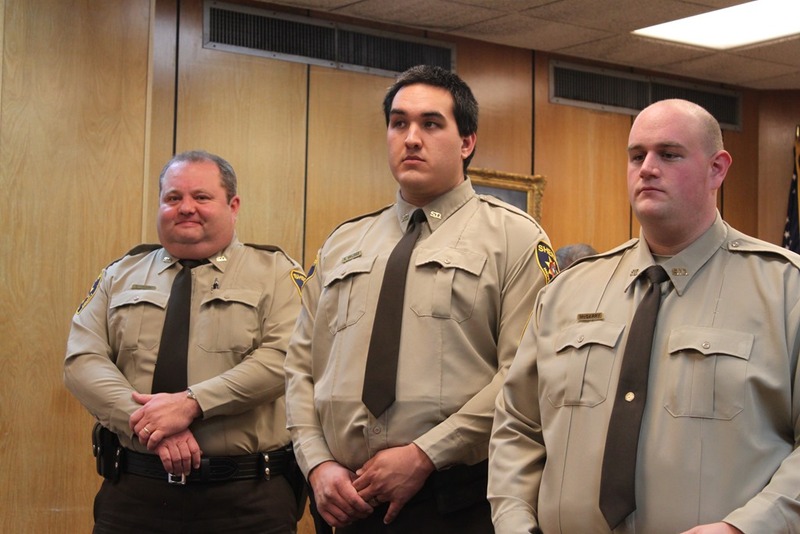 (Left to Right, Deputy Gabriel Villarreal, Deputy Lee Crossman, Lieutenant Patrick McFerrin, Lieutenant George Robinson, & Chief Deputy Derek Meador) (not pictured,Deputy Victoria Hatcher). 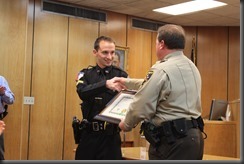 Sheriff David Duke presented Electra, TX Police Officer Christopher Barnett with the Sheriff’s Life Saving Award. On November 19, 2013, Barnett was approached by an elderly couple near the intersection of Front Street and Bailey Street in Electra. He was advised by the female that she believed her husband was having a heart attack. Officer Barnett then began escorting the couple to the Electra Hospital. A train was blocking the road and he was notified that the male had lost consciousness. Officer Barnett began administering CPR. Upon EMS’s arrival, the male was transported to the Electra Hospital. After arrival to the hospital, it was noted due to Officer Barnett’s CPR actions, the males heart began beating saving his life. ( Officer Christopher Barnett and Sheriff David Duke). 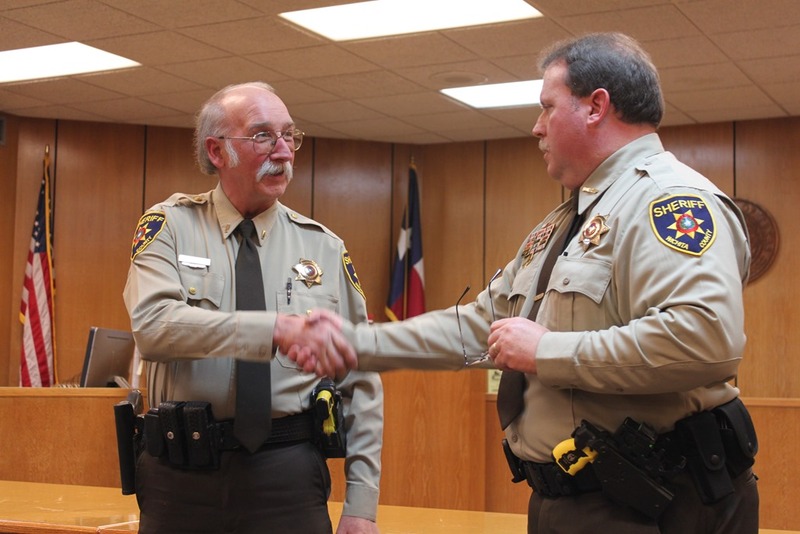 Sheriff David Duke presented the Sheriff’s Purple Heart Award to Lieutenant George Robinson. On July 19, 2013, Robinson and other Deputies were attempting to rescue two pilots involved in a plane crash. While scaling over a tall fence, Robinson landed poorly on his feet, causing a severe break. (Lieutenant George Robinson and Sheriff David Duke). 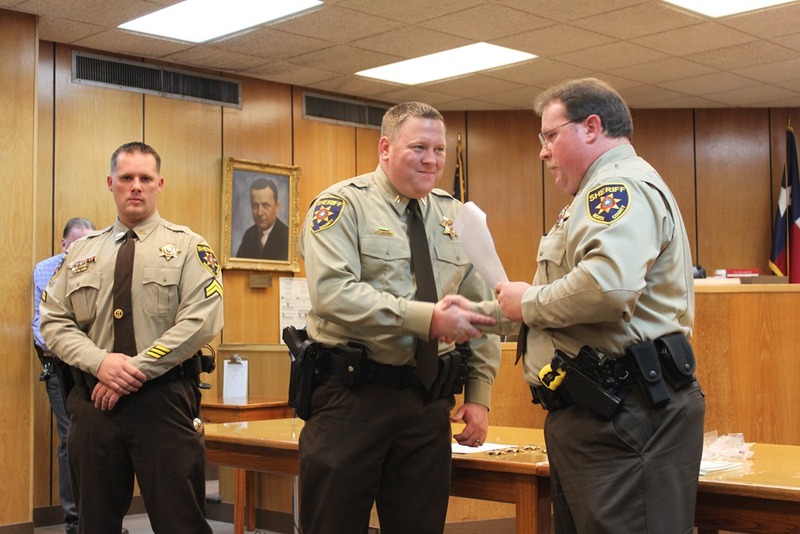 Sheriff David Duke promoted Corporal Patrick McFerrin to the rank of Lieutenant and Deputy Josh Brown to the rank of Corporal. (Left to Right, Lieutenant Patrick McFerrin, Corporal Josh Brown, and Sheriff David Duke). Sheriff David Duke swore in new deputies Kristian Valdez, Cole McGarry, and reserve deputy Brian Koschak. (Left to Right, Brian Koschak, Kristian Valdez, and Cole McGarry). 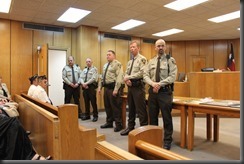 Sheriff David Duke swore in new detention deputies Michael Dozier, Jason Lavender, Samantha Muncy, and Steve Fontenot. 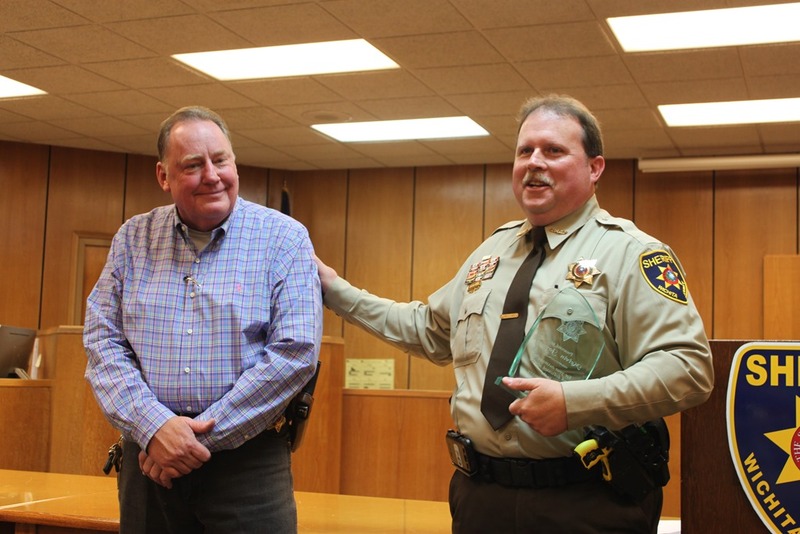 Sheriff David Duke recognized Lieutenant Robert Penaluna’s 35 years of dedicated service to the County of Wichita. Lieutenant Penaluna is currently assigned to the Court House Security Division and is the agencies head Evidence Custodian. ( Lieutenant Robert Penaluna and Sheriff David Duke). 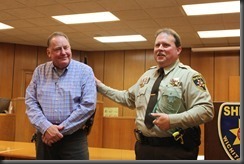 Sheriff David Duke presented Deputy Melvin Joyner with an Appreciation Award. 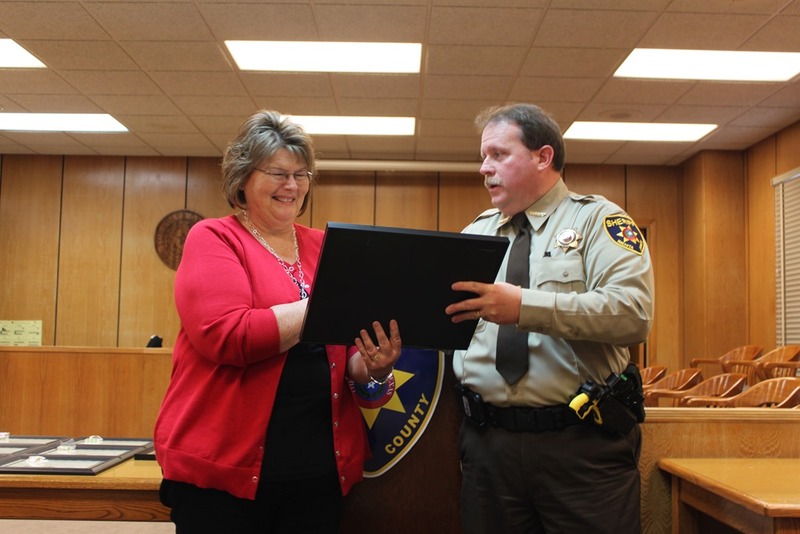 Joyner has been instrumental in establishing the first ever Wichita County Sheriff’s Office Citizens Academy and Neighborhood Watch Program. He is also responsible for many other community oriented programs and activities. 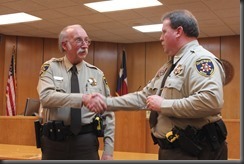 ( Deputy Melvin Joyner and Sheriff David Duke). 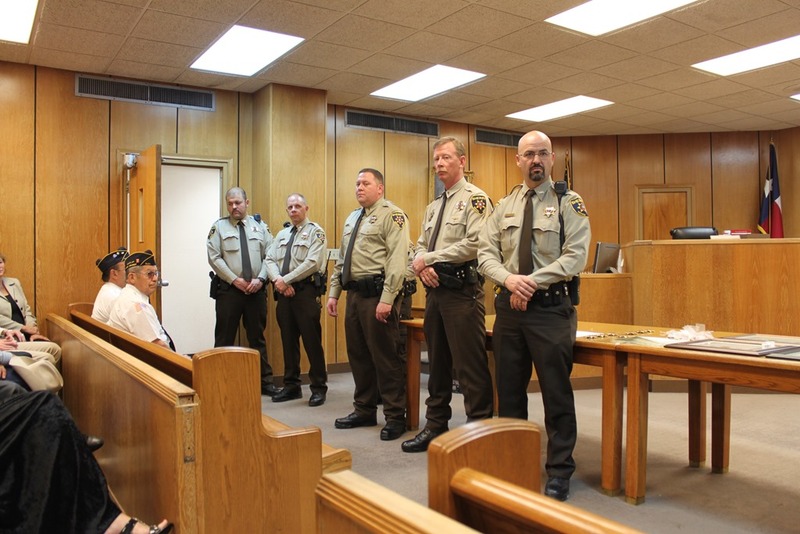 Sheriff David Duke honored 44 military veterans currently employed by the Sheriff’s Office and thanked them for their service to their country. The above awards ceremony was conducted on 19 Dec 13.